Containers, planters, pots…whatever you choose to name them, there should be a place somewhere in your landscape for one – or more. 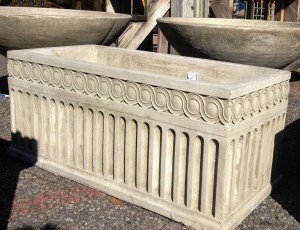 Shown here is a sampling of our 2014 spring order of cast stone, light weight fiberglass, terra cotta, and glazed pots. Well chosen and beautifully planted containers obviously add beauty to your home. This in turn enhances value by contributing to the overall curb appeal. So you’ve already got a couple of pots by the front door, you say? That’s one of the first places folks put planters. It’s an obvious choice, and a good one, since they define your entrance. This same idea can be used if you choose a planter to accent the beginning of a path, act as a focal point at a destination, or have a pair flanking a gate or other garden entrance. 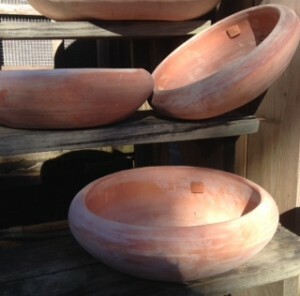 Perhaps there are areas in your outdoor spaces that would benefit from groupings of containers. Odd numbers are easiest to work with; use different heights and shapes to make it even more interesting. If your home has a lot of hardscape (walls, a wide driveway entrance or parking area) or other unplanted spaces, well placed containers can add to the design there too. 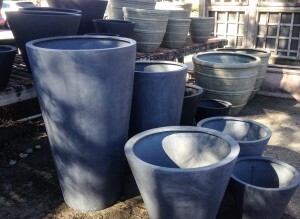 Tall containers can be easily filled with plants to spill over the edges to soften the landscape picture. Is there an area in your garden that nothing seems to grow or roots from nearby trees make it impossible to dig? 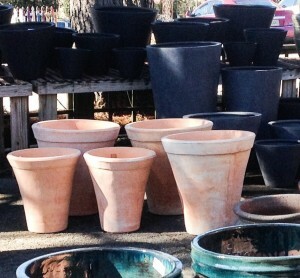 Think about placing an interesting pot or stacking pots to create an interesting focal point. Using similar containers throughout an area will create unity in your design (Though a little surprise here and there never hurt anyone!). Once your containers are in place and planted, watering and plant maintenance will be important – stay tuned for future posts. 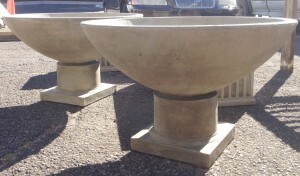 This entry was posted in Container, Statuary and tagged cast stone planters, concrete pots, containers, fiberglass planters, glazed pots, outdoor containers on January 28, 2014 by Kris Blevons.